We make it easy for you to get your wheel straightened with us. Either by sending the wheel by post or dropping it down to us for a same day turn around. We have been straightening cast wheels since the early 70s when they were first introduced to motorcycles. We repair cast, forged, and magnesium wheels for large insurance companies, British Superbike race teams, club racers and general motorcyclists. Wheels are trued hydraulically on our self designed jigs, just send us your wheel and we will advise on the best way to achieve the highest levels of accuracy. 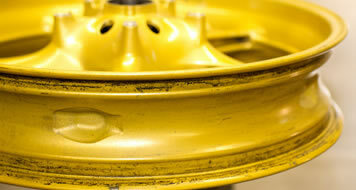 It is likely the finish of the wheel will be damaged from the original accident or from our repair. 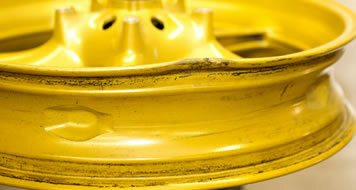 We have an extensive range of spray match colours for most wheels to make good the affected area. While we make our best efforts to duplicate the original finish in some cases this is not possible. If your wheel is obviously cracked we regret we cannot assist in the repair of your wheel due to level of damage. We beleive this to be beyond a safe repair. Just bring the wheel to us with the tyre and discs already removed. If you book an appointment in advance with us (via telephone on 01622 790 705) we can provide a 'Sameday Service' at no extra cost. You can also bring the wheel to us with the tyre and discs left on. 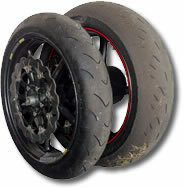 We will remove the discs and tyre, repair the wheel and refit the tyre fully balanced with the discs. We can provide a 'Sameday Service' with a pre-booked appointment (via telephone on 01622 790 705) at no extra cost. We make it easy to send in your wheel to us. 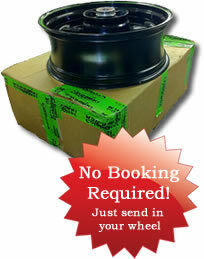 Just pack up your wheel and send via courier with the tyre and discs removed, no booking needed. 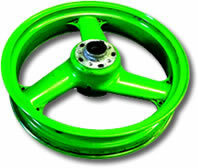 We aim to repair and return your wheel the same day we receive your wheel. Why not take advantage of our ride in service and have your bike wheel repaired in house, this makes the repair nice and easy for those who don't have the facilities or time for our other options. This service requires a pre-booked an appointment with us via telephone on 01622 790 705. Brilliant service, thanks very much. Quick turnaround and no nonsense. Looks like a new wheel!